All was not quiet on the western front. While the nation braced for civil war, frontiersmen brought their political leanings for the Confederacy or the Union to the western United States. As political bands began to form in the West, the federal government in Washington, DC, declared Colorado a territory in an attempt to place the region and its assets under Union control. When President Abraham Lincoln appointed his personal friend and former bodyguard William Gilpin as the governor of the Colorado Territory, he took a crucial step towards winning the war that would define his presidency. The mining industry in the West attracted men from North and South alike, and many came to sell mining tools and liquor, or to provide prostitutes, to prospectors and miners. Others continued west after coming from as far north as Maine to Kansas in response to the Kansas-Nebraska Act of 1854, a governmental experiment in which popular sovereignty would decide the fate of slavery at statehood. Some stopped temporarily on their way farther west. Many undoubtedly understood the urgency of the situation brewing in the country. The territory was then quite divided between Unionists and Secessionists in the territory, which was Union in name only. This was evident when local citizens formed the first two militia units—one was pro-Confederate, the other pro-Union. In one instance, a Denver citizen raised the Confederate colors over a Denver business. An enraged group of Unionists responded by threatening the man and the business with a mountain howitzer. When Gilpin arrived in Denver on 29 May 1861, he immediately sensed trouble. Upon hearing his report, Lincoln urged him to secure Colorado for the Union. As rumors of an imminent invasion from the South grew, Gilpin organized the purchase and donation of all the guns in Denver in order to arm a Union force and leave nothing in the way of arms for Confederate sympathizers. Gilpin, however, employed some unconventional means to procure weapons that later had serious repercussions. By issuing unsigned and unauthorized drafts on the U.S. Treasury, he was able to “pay” the contractors. Gilpin soon ran into trouble when the federal government refused to honor the drafts, and he was eventually replaced as governor in April 1862. While his financial dealings came back to haunt him, few outside of Denver understood that, in the end Gilpin accomplished his mission to secure Colorado for the Union. Major Henry Hopkins Sibley, born and raised in the slave trading city of New Orleans, found it easy to sympathize with the Southern cause. Often stationed in remote western posts such as Cantonment Burgwin and Fort Union in New Mexico Territory, Sibley had an eternity to consider the opportunities for glory and notoriety that he was missing as the war raged in the East. Sibley had a creative mind and was extremely innovative— he invented and developed the Sibley tent and Sibley stove, both in use by the Union Army at the time. He was also prone to drinking prodigious amounts of whiskey. In mid-September 1861, Sibley arrived in the Confederate capital of Richmond, Virginia, to present his plan to seize control of a large part of the American West and place it under Rebel control. Confederate President Jefferson Davis was so taken with the plan that he quickly approved it and promoted Sibley to the rank of brigadier general. Sibley’s plan to dominate the western portion of the continent called for Texas Confederates to march from Texas through New Mexico, Colorado, and Dakota Territories to establish a western front. The coal, gold, and mineral reserves found beneath the Rocky Mountains would then finance a march to link up with Confederate forces in the East. Control of the West Coast would also pique the military interest of Europe and perhaps Asia, while establishing trade with countries of those continents. This would do much to increase the legitimacy of the Confederate cause in the eyes of European and Asian governments, and perhaps an alliance could be struck. Furthermore, a Confederate spy with part-time residence in Denver maintained communication with the Texans and had identified Brigham Young and his force of nearly 1,000 armed Mormons in Utah as possible allies should the Confederates make it that far west. It was also presumed that the locals of Mexican descent along the Rio Grande would be happy to support the Confederates, with the horrible memories of the Mexican War still fresh. Operating in the cold month of February, Sibley’s force, comprised of the 2d, 4th, 5th, and 7th Texas Mounted Rifles, plus artillery, would travel up the west bank of the Rio Grande, along which many Union forts were aligned. His idea was to pack light and resupply at each captured fort. Speed was paramount in order to gain the most ground before the Union could discover their intent. Sibley had spent a significant portion of his career at posts along the Rio Grande and at Fort Union. He knew the environment and terrain well and understood that there were ample weapons and supplies at the posts along the route. As rumors of this Confederate invasion began to spread north, Union Colonel Edward Canby began to appeal to Governor Gilpin to gather all the soldiers and arms possible and send them south to assist in repelling the Confederates. 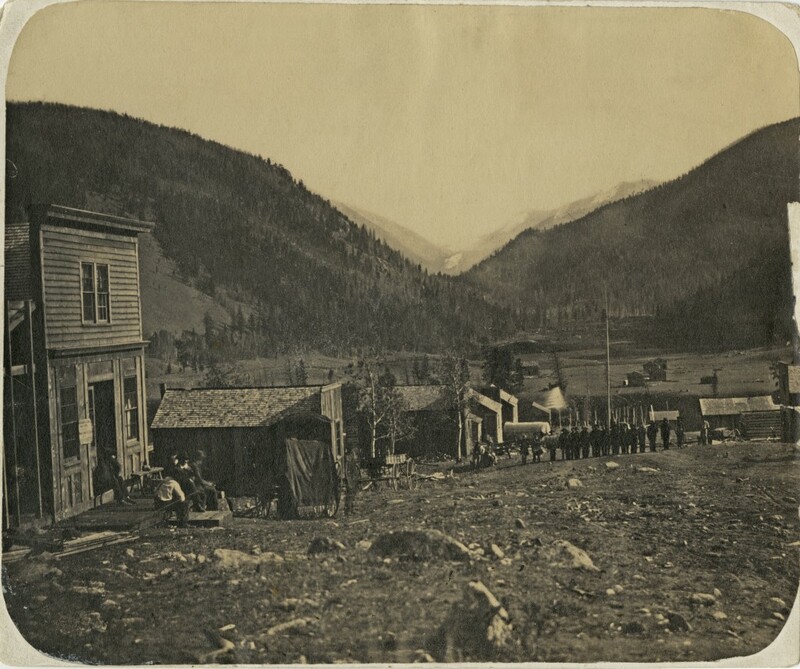 Gilpin quickly acted, commissioning local attorney John Potts Slough as a colonel with orders to raise a regiment of infantry, which soon became known as the 1st Colorado Infantry. While organizing the regiment, Colonel Slough asked the Reverend John N. Chivington, a notable Methodist minister in Denver, if he would to serve as the regimental chaplain. Chivington declined, insisting upon a “fighting commission.” Thus, he was commissioned a major in the 1st Colorado and was well loved by all of the officers and men of the regiment, no doubt drawing on his lifelong experiences of leading and counseling congregations. Meanwhile, back in Texas, Sibley’s presidentially approved plan to take the West was going nowhere. The lack of decisive and immediate action allowed reports of the Texans’ movements to reach Denver and potentially allow the Union forces in the region an opportunity for timely action. However, Colonel Slough did not act quickly and decisively, allowing precious weeks to pass before the unproven 1st Colorado was ordered from their bivouac at Camp Weld south of Denver to Fort Union, New Mexico, in order to stop the Rebel advance. In the meantime, the soldiers found ways to make up for their restlessness. Whether patriotism, politics, or profession was their motivation, all were ready and eager to fight the Rebels. As precious days slipped by with no orders, some soldiers exercised their foraging skills, acquiring rations of every kind to enhance their stay in camp. Tensions began to mount in Denver between the soldiers and citizens, and local newspapers expressed discontent with the soldiers’ unpunished behavior. 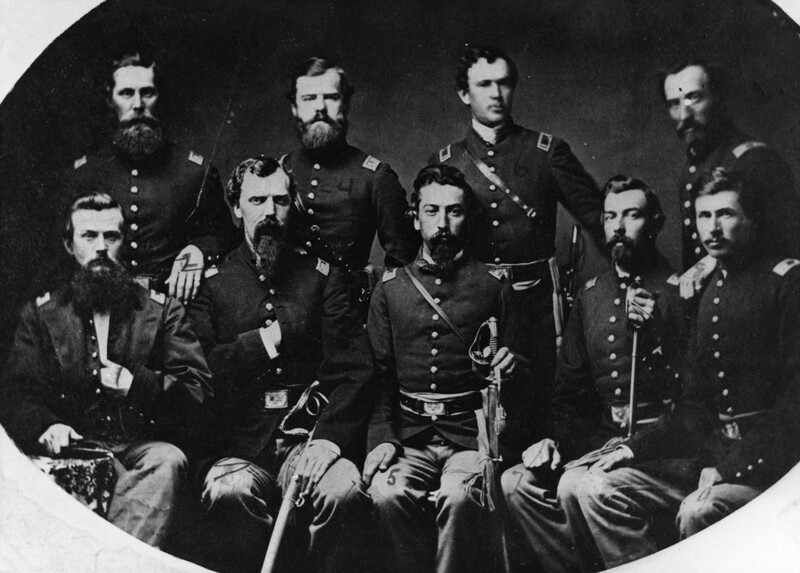 Finally, in February 1862, the 1st Colorado received its marching orders. Traveling southward through the Colorado wilderness, the volunteers marched upwards of forty miles per day in near-blizzard conditions reaching Fort Union several days before Sibley’s Texans. In order to increase the speed of their forced march, the soldiers would hop onto the back of a wagon train, eat their rations quickly, and rejoin the trek on foot. The 1st Colorado moved this way for two weeks. During the journey, Colonel Slough made an unpopular move when a shortage of available wagons did not allow for even distribution among the companies. Most companies within the regiment were allotted two wagons, but one company would have to make do with one. The predominately German Company I, commanded by Captain Charles Kerber, was selected. This choice caused such a stir that a mutiny took place and Slough was threatened with his life. He asked Major Chivington to calm the situation. After he spoke to the men of Company I, the German soldiers backed down and order among the regiment was restored. In thirteen days, the column made it over the rugged Raton Pass and across the barren snowy flats of northern New Mexico to Fort Union, a journey of over 400 miles. Already unpopular with his own men, Slough made more enemies by establishing himself as the post commander over Colonel Gabriel Paul by virtue of date of rank. Paul, a career officer, was promoted to colonel a matter of months after Slough was appointed colonel by Governor Gilpin. The journey up the Rio Grande was no less intense for the Texans. Believing correctly that the locals would welcome any opposition to the Union, the Texans erred by carrying the Texas flag on their journey instead of the Confederate Stars and Bars. If there was an entity that the local Hispanic population hated more than the United States, it was the Republic of Texas. Whether merely unfriendly or intensely hostile, the Texans felt the wrath of the local populous through the duration of the trek northward. Furthermore, as the Texans advanced, Union troops emptied or burned the military posts and supply depots prior to the enemy’s arrival. When the Federals successfully defended Fort Craig, New Mexico, in the Battle of Valverde on 20-21 February, the situation became dire for the Texans. They were now forced to take refuge in Santa Fe, divide their forces, and take Fort Union in order to continue. Commanding the Military District of New Mexico was the very capable Colonel Edward Canby, a West Point graduate and Regular Army officer. He had ordered the commander of Fort Union to hold the fort at all costs. 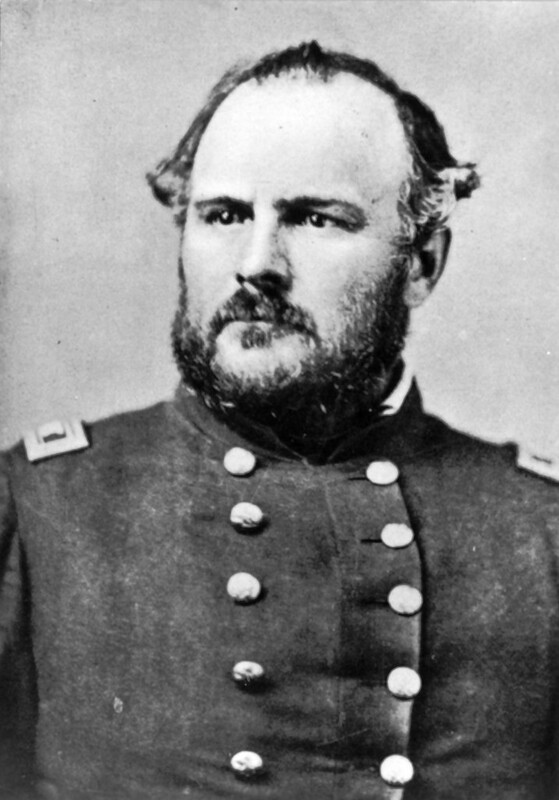 In fact, he wrote, “Let the whole of Fort Garland and Denver burn, but hold Fort Union.” He understood the strategic importance of Fort Union, as its location controlled movement along the Santa Fe Trail and the surrounding region. In addition, the fort housed a significant arsenal of weapons and large stores of ammunition and supplies. As railroads had not quite made it to New Mexico Territory in 1862, the Santa Fe Trail was the primary transportation route west in southwestern United States. Hardly taking time to rest, the Colorado “Pikes Peakers” immediately began to exhibit the type of initiative and ambition that would come to define them in this and several future campaigns. Slough assumed command of Fort Union and told Major Chivington to prepare a force of three companies of foot soldiers and one mounted company to search for Sibley’s advancing men. While camped for the night on 25 March near La Glorieta Pass, Chivington assembled a twenty-man detachment from the mounted company to find some actionable intelligence. The men captured a small contingent of Sibley’s scouts near Pigeon’s Ranch, including two Coloradoans who sided with the Rebels. These scouts provided enough information on the whereabouts and intentions of the Confederate force for Chivington to initiate movement. On 26 March, the 1st Colorado, along with elements of the 1st and 3d U.S. Cavalry Regiments, began movement towards the suspected Confederate force. In what was essentially a movement to contact mission, the two sides met at Apache Canyon on the west side of the Grand Mesa between Johnson’s Ranch and Koslowski’s Ranch. 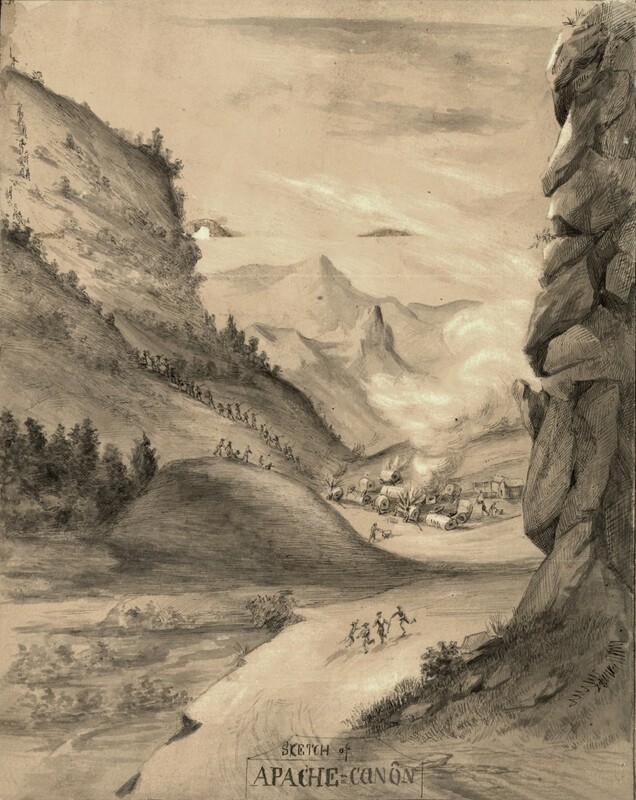 Already accustomed to altitude and mountains, a few companies of sharpshooters took to the high ground offered by Apache Canyon, and after hundreds of well aimed shots, and a well-executed and well-timed cavalry charge led by Captain Samuel Cook, the counterattacking Rebels withdrew. The day ended with the Coloradoans holding the field, having pushed the Texans several miles back to an area near Johnson’s Ranch at the mouth of Apache Canyon. Taking a day to reorganize, both Union and Confederate leaders began to plan their next moves. The Rebel plan involved making better use of bluffs and high ground. It also called for an entire company to guard the Rebel supplies against looters or a surprise attack. This was a controversial decision, as the Texans had few men to spare for the upcoming battle. The Coloradoans planned to divide their forces as well, putting Chivington in charge of a 400-man column that included troops from the 1st Colorado, 5th U.S. Infantry, and some New Mexico militia. With assistance from New Mexico Lieutenant Colonel Manuel Chaves, Chivington’s column was to locate and destroy the enemy supply trains. Colonel Slough also ordered Chivington to be prepared to support the main Union force with a charge on the Confederate’s right flank if he heard the sound of guns. 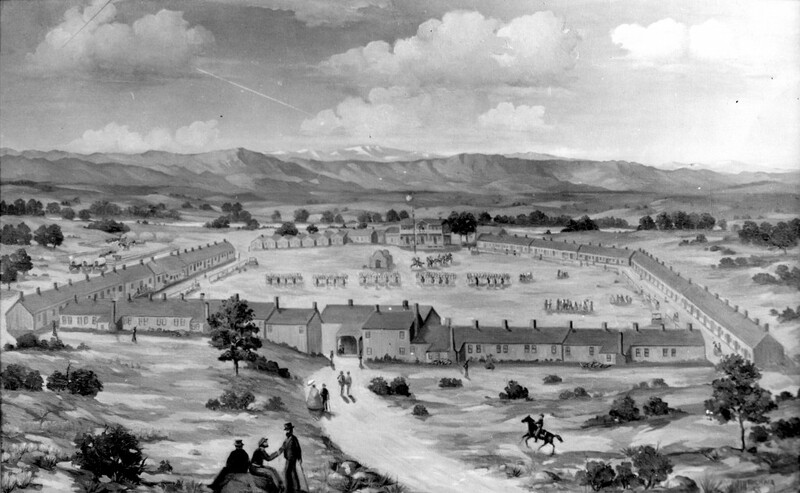 On the morning of 28 March, the Colorado infantrymen, having come down through Bernal Spring and Pecos and moving northward up Glorieta Pass, encountered a Texan force moving southeast from Santa Fe, one of the few instances in the Civil War which saw the North attacking northward and the South attacking southward. Colonel William R. Scurry, the Rebel field commander (Sibley was in Santa Fe “sick”), had left a company of German soldiers in charge of securing his supply trains at Johnson’s Ranch. His column had proceeded south and, at first contact, spotted Slough’s regimental colors maneuvering for an apparent assault on his right flank. He began to concentrate indirect fire toward that area in support of the three companies on his right flank while maintaining the combat power already on his left. Unbeknownst to Scurry, Slough had merely assigned his color bearer to move to the Texans’ right flank with Captain Jacob Downing’s Company D, 1st Colorado (under the protests of both Downing and the color bearer), in order to disguise the main effort. The second part of Slough’s plan was to have Kerber’s Company I assault Scurry’s left. Maintaining his position at the center of the Rebel line, Scurry was able to detect Company I’s movement along a gully to his left and deployed two companies of Texans to turn back that assault. What followed was some of the most intense close-quarters combat of the battle. One Texan loaded his shotgun with five rounds in each barrel, along with extra gunpowder, and emptied the contents down into the low ground, killing at least four soldiers of the 1st Colorado’s Company I with one blast. In another incident a Texan, who had been seriously wounded in the stomach, carried his own bowels in his hands for a moment and tried to replace them inside his wound. When these attempts were not successful, he turned to his comrades, beckoned them to continue on, and destroyed his weapon so that it would not be taken by the Coloradoans. Whiz, whiz, and the crack of the rifle was the only music heard for some time, during which many a poor fellow made the passage to “that borne from whence no traveler returns.” Suddenly the guns of the battery were turned to the left [onto Company D’s position], followed by a loud explosion—the whistling of grape, the falling of [tree] limbs, the low cry of some brave fellow, for some time was all that was heard. Company D, 1st Colorado, would sustain more than twenty-five percent casualties in that morning skirmish and would eventually be replaced by Companies G, K, and a portion of I, as well as two artillery pieces to counter the massive firepower the Texans deployed against Downing’s company. After turning away the assault on the left and neutralizing the Coloradoans on the right, Scurry turned his attention to the center. The Coloradoans and Texans would trade ground back and forth as a result of several attacks and counter-attacks at the center of the battlefield, none proving successful. I llustrating the intense confusion of battle was the experience of a Texan who ventured ahead of his line and found himself closer to the Union troops than his own. A Colorado officer instructed the soldier to get down and “tighten it up” before he was hit by the enemy. As the Union officer pointed to the Texans, it then dawned on the Rebel soldier, who was wearing a Union blue coat that he had scavenged from a dead Colorado soldier, that he was misidentified as a Coloradoan. He waited for an opportunity and successfully returned to his own line. After some time, it became evident to Scurry that the key to victory was possession of an outcropping of high ground on the southeast portion of the battlefield that afforded command of the entire area. The Coloradoans held that position, and Scurry became determined to capture it. Meanwhile, Chivington’s column of mounted scouts had made their way across the Grand Mesa and had located the Texans’ supply train. Inexplicably, it appeared unsecured, with merely a handful of soldiers guarding the train and a handful of prisoners. Chivington deliberated before attacking, taking several factors into consideration—Was this a trap? Were the Rebels waiting for this attack? Did the main body need his support down near Pigeon’s Ranch? Was this the bulk of their supplies or would this make barely a dent in the Texans’ logistical capabilities? Why were so few troops left to guard this area? There was a lot to consider and Chivington and his men began to plan the descent and the retrograde movements. After considering all the factors, Chivington ordered his Coloradoans to attack. 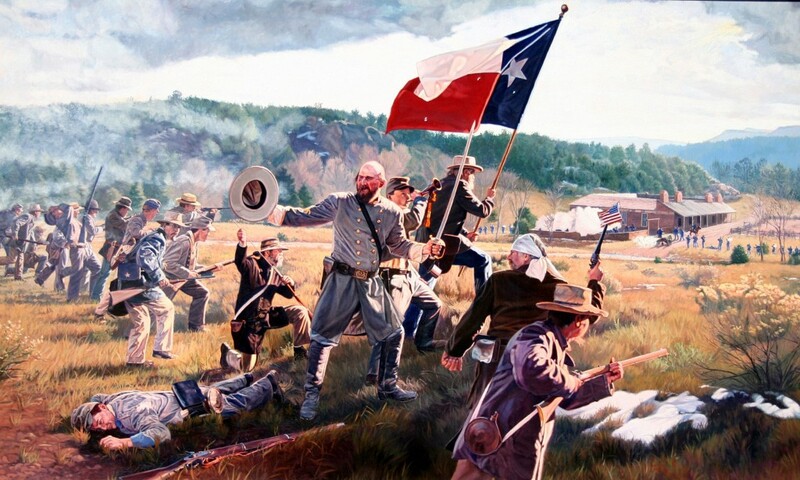 The charge was quick and devastating, as nearly 400 men descended over 1,000 feet and easily defeated the handful of Texans left behind to guard the supplies. The Coloradoans destroyed the wagons, set the supplies ablaze, and freed several Union prisoners while capturing many of the Confederates guards. This was indeed the sum total of the Confederate resupply, and without it, they were crippled. Meanwhile, the battle raged on near Pigeon’s Ranch. As Scurry contemplated how he would wrest it from the Coloradoans, a company of fresh Rebel soldiers seemingly appeared from nowhere and flanked the Union right. With the Coloradoans on the high ground focused on the center of the battlefield, the company of Texans drove them from the ridge after intense fighting. This Texas company was the unit left in charge of securing the supply trains set up near Johnson’s Ranch, but it had moved quickly toward the sound of the guns when they heard the battle and proved key in winning the fight at Pigeon’s Ranch. However, because that company left the trains to assist with the fighting, the Rebels’ vital supplies were destroyed. Less than half a mile of the pass was contested over the course of the entire day, and the fighting at Pigeon’s Ranch ended with the Texans holding the key terrain and most of the contested field. The battle had seen flanking movements, hills taken and retaken, cavalry charges, artillery barrages, and close-quarters combat. In the end, it was a Methodist preacher who was given a fighting commission who carried out the battle’s decisive action. Chivington, nicknamed “The Fighting Parson,” would gain immense popularity for his leadership ability as well as his charge on 26 March and the destruction of the Texans’ supplies on 28 March. This lethal strike turned out to be the decisive blow, as it crippled the Texans. At the end of the day, the Texans were forced to conduct a long, disastrous journey back to Texas, facing starvation the entire way. Though no Confederate campaign would ever again surface in the West, the Coloradoans and Union forces in the area remained on their guard until the end of the Civil War. As for the Coloradoans, the tactical application of logistical support nearly spelled their doom as well. Captain Herbert Enos, a Regular Army ordnance officer, had some heated differences of opinion with Colonel Slough as to where best to safely emplace the Union supply trains. Slough of course won the contest, but Enos ensured the trains were emplaced in such a way that they could be quickly withdrawn to safety if compromised. Scurry had spotted these trains shortly after hearing about the destruction of his own supplies and ordered an attack that resulted in one of the wagons being burned, but due to Enos’s tactical prowesss, the trains were secured before any more wagons were lost. 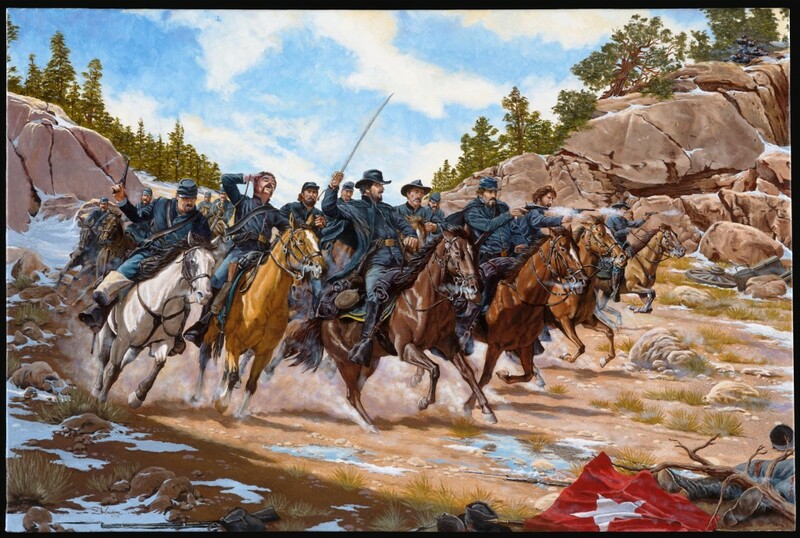 The Battle of Glorieta Pass was the first hostile engagement for the 1st Colorado Volunteers and it was a huge success. According to the 1993 Congressionally-appointed Civil War Sites Advisory Commission, the battle had as much or more impact on the outcome of the Civil War as the battles of Gettysburg and Antietam—the battle is sometimes referred to as the “Gettysburg of the West.” A Confederate victory could have transformed the conflict into an East-West battle and would quite potentially have invited alliances with foreign countries had the Confederates achieved that level of legitimacy. This important turning point of the Civil War will be memorialized this year. In 2012, the National Guard Bureau commissioned artist Domenick D’Andrea to render the Apache Canyon charge as a National Guard Heritage Series painting. The painting, which appears in this article, was completed in February 2013.